Growing godly stewards is one of the most pressing issues facing the Church. To help churches and ministries, Chris McDaniel, Author of Ignite Your Generosity – A 21-Day Experience in Stewardship, has developed the Stewardship Bookmark to inspire Christians to faithfully steward their time, talents and treasures. 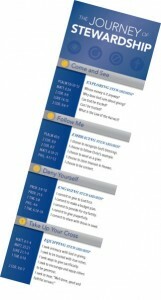 The Stewardship Bookmark is designed to be a quick-reference tool that churches and ministries can give to their constituents as a practical “take away”. Ideally, this new tool will compliment a stewardship series, class, or workshop or can be given out in a regular mailing. The front of the bookmark outlines a four-phased growth process of a disciple with supporting Scriptures that relate to stewardship. Those phases are: Come and See, Follow Me, Deny Yourself, and Take up Your Cross. The back of the bookmark highlights some of the most prevalent lies from Satan and the opposing Scriptures that guide to truth. Consider sharing this resource with your members, helping each individual learn basic principles and concepts about biblical giving. They are available for as low as .97 cents printed or you can also buy a print license as low as .39 each. The Stewardship Bookmark can be ordered online at www.stewardshipbookmark.org. Bulk and quantity discounts are available. Previous PostPrevious One Bad Dude!